The Nature’s Bounty Foundation is committed to enhancing lives by addressing wellness in many forms. Its generous contribution of $25,000 to Newsday Charities will support grants to Long Island non-profit agencies that offer educational opportunities and work to alleviate hunger, homelessness and child abuse. Newsday covers all costs, so 100% of this gift will help Long Island’s most vulnerable children and families. Virendra Patel and Girish Patel of BAPS Charities, Debby Krenek, Publisher, Newsday; Paul Fleishman, VP Public Affairs, Newsday; Nilesh Patel, BAPS Charities and Dale Cole, Community Affairs Project Manager, Newsday. 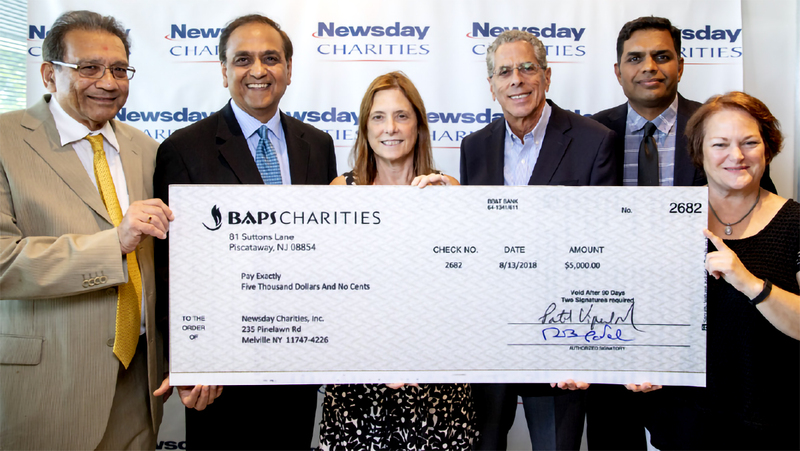 Thank you to BAPS Charities for including Newsday Charities Kids Campaign as a recipient of funds raised through its recent Walk Green 2018 walkathon. 100% of this gift will support local nonprofit agencies that provide Long Island’s most vulnerable children and families with healthy meals, educational opportunities and programs to alleviate homelessness and child abuse. © 2019 Newsday Charities. All Rights Reserved. Newsday Charities is a registered 501(c)(3) organization #36-4868152. Your gift is tax deductible to the extent allowed by law.